I watched Rachel Ray last night and her show was all about rolling over leftovers. Try to make your food dollar stretch by re-purposing your dinners into some great breakfast, lunches, and dinners. I love this idea! I think it is important to find ways to not throw out food. Food cost money, and no one wants to throw money away! You may remember last night I raved over my leftover Ragu sauce. I was thinking of this dish last night when I typed out my dinner post. It was everything like I imagined it would be! 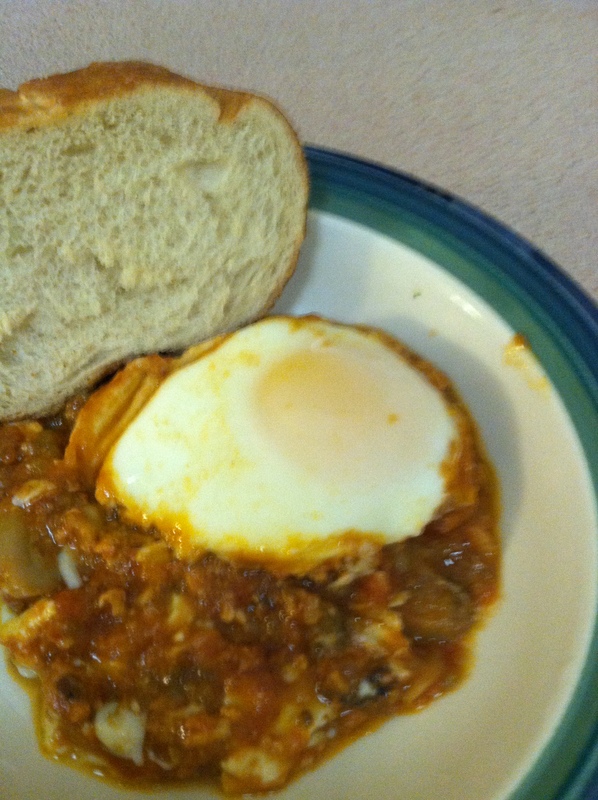 Eggs Diablo, or Eggs in Hell, are eggs poached in fiery tomato sauce. 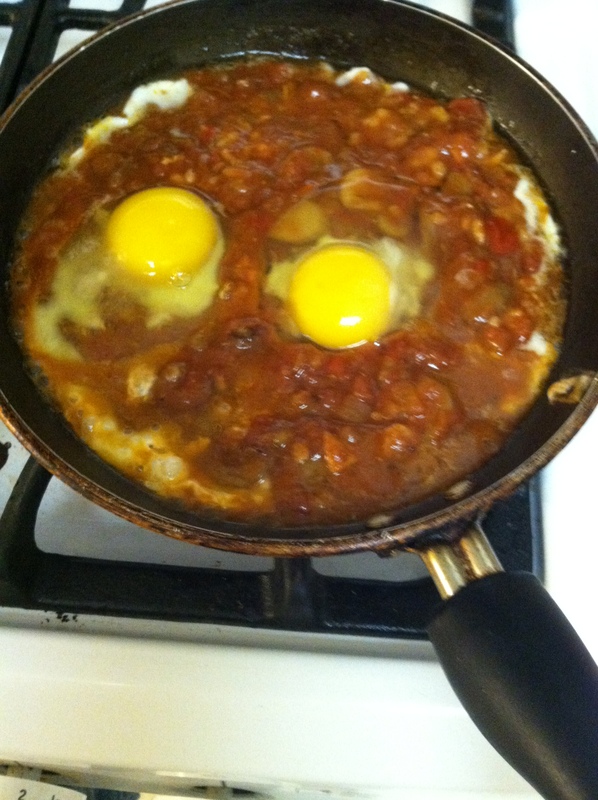 I decided to re-purpose my Ragu sauce by adding some hot sauce in it to and poach the eggs. Serve with some crunchy bread for dipping. Easy and fast. I made this dish in about 10 minutes. First I added my leftover Ragu to the pan and put in a few good shakes of hot sauce. Then I cracked 2 eggs on top. Cook for about 5 minutes uncovered. Then take off the heat and add a lid to poach the eggs in the steam. You could also cook this in the oven if you wanted to… 350 for until the eggs are cooked how you like. Money shot! 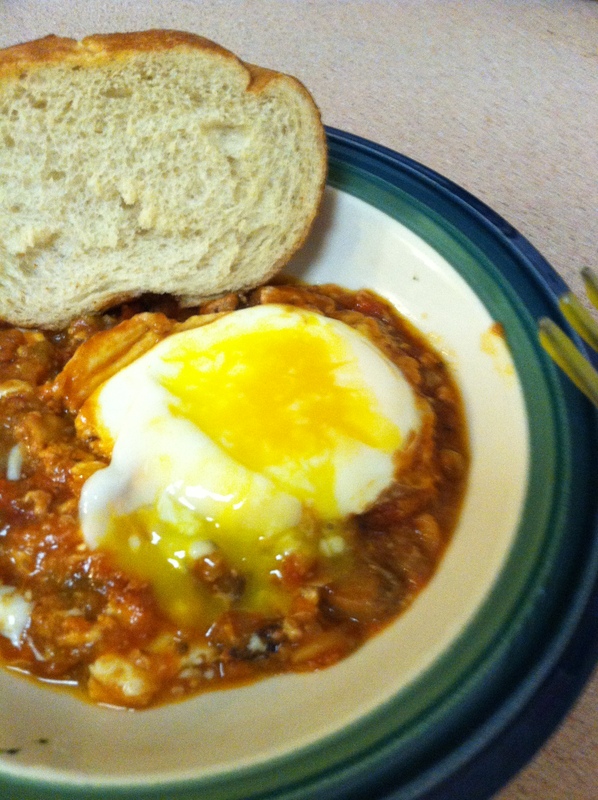 Runny eggs are crucial for this dish. The rich yolks and tomato sauce dipped up on a piece of toast…Just yum! You could totally use this as a thick soup and add some tortilla pieces, avocado slice, and a dollop of sour cream. I have more Ragu in the fridge, so I will def. be coming up with another recipe or 2 to rollover this sauce. What is your favorite way to rollover leftovers? My “rollover” this week was that on Sunday my husband was going to make cauliflower cheese pie from The Moosewood Cookbook. He discovered we were out of butter, so instead boiled the cauliflower and potatoes until they were soft and then added half and half and cheese (also some onions). Then he got ahold of my immersion blender and blended it until it was very soft and then baked it in a casserole dish. It was yummy, but very “thin”. Last night I took what remained, added 4 cups of chicken broth, garlic, onions, frozen corn, chopped carrots and ham and turned it into soup! It was fabulous – like a cheesy potato soup. I pulled a loaf of roasted garlic bread out of the freezer and we had soup and bread for dinner. I told him he can make my soup base any day if it turns out like that! Love that idea! I was actually thinking of warming the rest of the Ragu tomorrow night and blending it with my immersion blender to make soup! Then, I was going to add some store bought ravioli and top with Parmesan.